On the occasion of its first anniversary Heterodox Academy asked its members what they’d like to see in academia in 2025. My response to the question takes a bit of a contrarian approach. Proper treatment of a disease requires proper diagnosis of its cause. 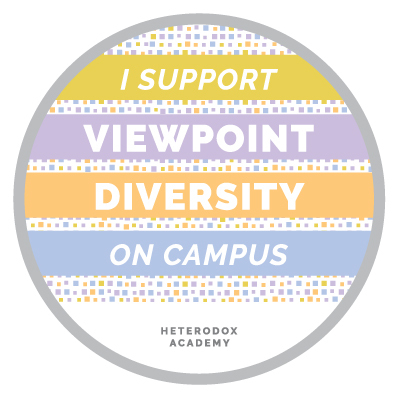 I propose that the lack of viewpoint diversity highlighted by Heterodox Academy is a symptom, not a cause, of the disease of the Coming Apart , The Coddling of the American Mind, the anti-free speech movement, and generally the partisan rancor we’re witnessing today. Based on this I suggest that working to improve viewpoint diversity may be palliative but it can’t be curative. It may relieve some of the symptoms of the disease, but it can’t inoculate us against it. It’s a pain reliever, but it’s not a vaccine. I offer for consideration the following diagnosis of what I believe to be the true root cause of our current problems. Based on that diagnosis I then describe what I’d like to see in academia by 2025, which I believe to be a true vaccine. In short, the disease is WEIRDness. We conflate WEIRD thinking with actual science. When we’re doing the former we believe we’re doing the latter. It’s a false equivalence. Nonetheless this conflation is a sacred value of our culture. Ideas are not valid unless they can be “proved” with fMRI, or with peer-reviewed academic papers full of statistics, regression analyses, curve fitting, and bar charts. If David Hume, Edmund Burke, Adam Smith, Alexis de Tocqueville and others like them were alive and writing today they’d be rejected as science-deniers whose “ magical,” “faith-based” thinking is unmoored from reality (where “reality” is defined as WEIRD thinking), and whose high minded rhetoric serves only their own personal, partisan, “biased,” agendas. They’d be disinvited from speaking on campuses. If they made it to campus they’d be shouted down. Their ideas would be seen as microaggressions against the prevailing “enlightened” world view. The logical thread of WEIRD thinking leads us to believe in fundamental truths about ourselves that are in fact untrue. The three “entrenched yet questionable orthodoxies” listed on Heterodox Academy’s “Problem” page are merely the tip of a massive iceberg false beliefs that nonetheless form the bedrock upon which much (most? All?) public policy is constructed. A proposed more complete listing of falsehoods commonly thought to be truths is here. Reason-based choice is not merely a cognitive bias of our individual righteous minds, it is a defining characteristic of our entire WEIRD culture. To this very day we remain as mired in the tunnel vision of the “two hundred year tangent” of “The Rationalist Delusion” as we have ever been; possibly more so, so sacred is the value, so near-religious is the belief, that WEIRD thinking is science, and science has all the answers. Culture and the psyche make each other up. Viewpoint diversity is of little value in a culture that is for all intents and purposes one hundred percent WEIRD. I would like to see two general types of changes in academia by 2025. I propose some concrete, practical, achievable, real-world things we can do to start making those changes in 2016. By 2025 I would like to see academia standing athwart the rationalist delusion of our WEIRD reductive-thinking culture yelling Stop! I would like academia to have taken on the mission of mythbusting the “entrenched yet questionable orthodoxies” – the flat out falsehoods – that because of our WEIRD culture have become the foundational “truths” upon which it is built. Karl Aquino’s suggestion of “courageously challenging social facts” comes close to the idea I’m getting at, but I think what’s needed is more specificity as to what to challenge and how to challenge it.